Hello. I was sitting at my local big box coffee shop again when I had the idea to write this post. These are more random thoughts & various things that I wanted to write about. I was casually & very conspicuously staring at the FedEx deliveryman who was wearing a pair of unflattering FedEx uniform shorts. I was thinking to myself, as I was so obviously gawking at this harmless gentleman, that thank goodness it’s sunny outside because this guy needs to get some color on his pale legs. I also fleetingly thought he had a generic pair of typical men’s legs, very average. Please don’t ask me why I was staring at this guy specifically. I was sitting at the counter right next to the drinks drop-off area & was just casually observing all the people passing through the coffee shop. An older adult gentleman sat down in the seat next to me after picking up his mail from the post office next door. You can probably guess what happened next. Yes, I had to stick my nose in this guy’s private business & snoop at what he got in the post. I know it’s controversial (in some societal, moral, mannerly way) to be so blatantly staring at other people & their private business, but I am an observer. I like to observe the things & people around me. Some people call it “openly staring in a creepy way”. Other people call it “an invasion of privacy”. I call it “being aware of my surroundings”. I wasn’t purposely trying to look at this man’s mail, but he was practically flaunting it by putting it right inbetween us on the counter in plain view of us both. The packages & post were just begging to be ogled at by all eyes. As I’m typing this blog post, I’m listening to both the Midnight in Paris movie soundtrack & the Funny Face movie soundtrack (a.k.a. original motion picture soundtrack), both on Spotify. I’ve been listening to both soundtracks on repeat for the past couple of weeks. You should know me by now. Once I find something I like, I will stick to it until the very end of my days. So far I have two standout favorite songs, one from each soundtrack. On the Funny Face movie soundtrack, I love all of the songs, & can sing almost all of the songs by now, but my standalone favorite is “On How To Be Lovely”. On the Midnight in Paris movie soundtrack my favorite is “Let’s Do It (Let’s Fall In Love)” the cover of the famous Cole Porter song. Last week I watched a highly anticipated movie. Based on my above mentioned icon, you can obviously guess which movie I’m talking about. Since I’ve been a long-time devoted fan of the original source material for this movie, I went into the theater with a lot of unrealistic expectations…meaning, I went to watch the movie with the mindset of comparing the movie adaptation of the original source material. That was a stupid thing for me to do. I should’ve just checked my over-zealous fangirl mentality at the door & enjoyed the movie for what it was, pure entertainment through & through. After watching said movie, I went through the initial period of picking apart the movie & comparing it nearly word-for-word to the source material. Once I got over all of those trival quips & squabbles, I was able to appreciate the movie for its own qualities. I enjoyed the movie so much so that I already pre-ordered the digital download on iTunes. Yeah, I enjoyed the movie that much. Also, I highly admire the creativity & talent of the source material’s creator & actors. I wanted those people to make money off of me & help their success grow, plain & simple. Adding on from the last bullet point, because I was so enamored with the movie I watched last week, I went back to re-examine the original source material the movie was based on. I’ve gained a new perspective from re-examining the source material, & it has made me fall in love even more than I already am. Re-reading the source material again (for the **th time) has had me re-thinking about various scenes & pick up small details that were previously misinterpreted &/or overlooked. I am now appreciating the source material in a whole new way. a vegitarian. God knows I love a good slab of medium-rare steak (& other delicious meats), but this no-meat wrap is sooo tasty too. Well, this concludes my random blog ramblings. Until next time, cheers! Hector is a young psychiatrist in Paris who does not understand why his patients in this most beautiful of cities are unhappy. So he decides to take a trip around the world–from Paris to China to Africa to the United States–and to keep a list of observations about the people he meets, hoping to find the secret to happiness. I have certainly recommended this book to a few people since I’ve read it. I really like the story line of this book, about a well-liked, yet seemingly unhappy psychiatrist who goes on a personal journey to discover the meaning of happiness (What is it, & how do you achieve/obtain it?). 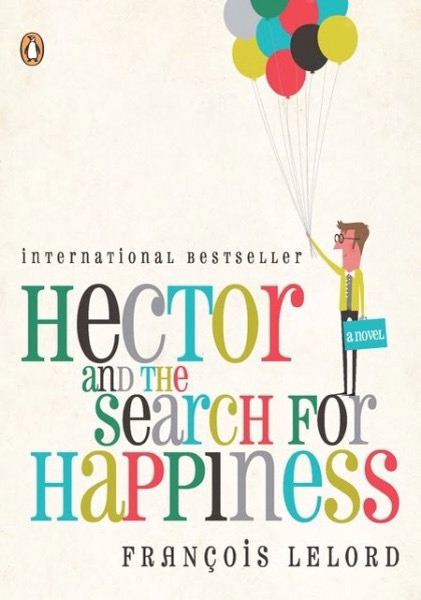 Throughout the story, The main character Hector meets many interesting people, goes on a few adventures, & keeps a notebook with a list of points he writes down of what makes up the meaning of happiness. 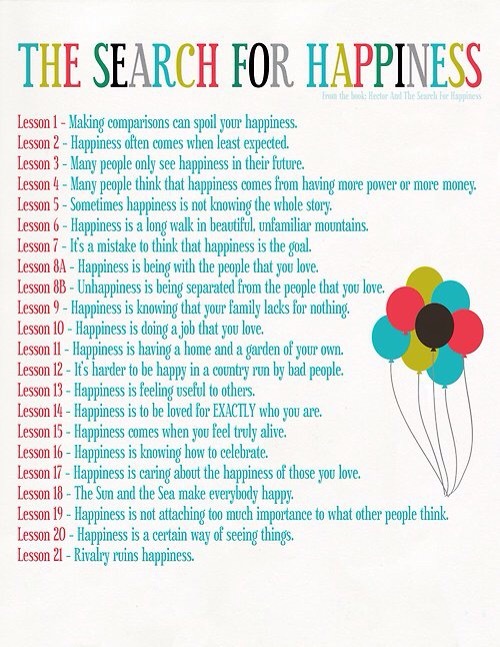 After reading this book, I re-read the points of what makes up the meaning of happiness to see if I could draw any similarities to my own meaning of happiness. Little did I realize that I already followed this list of points. That made me happy. Recently, I found out that this favorite book of mine had been turned into a movie starring actors Simon Pegg as the title character Hector & Rosamund Pike as Clara (Hector’s great love/girlfriend). I was completely over the moon to find these two actors starring in this movie. I’ve loved them in all the other movies they’ve acted in together (eg. Shaun of the Dead, The World’s End). I really think this movie was nicely cast…however, I just can’t get over seeing Simon Pegg with so much hair. It’s really making me do a double take every time I watch the trailer or see photos from the movie. Ok, hairstyle aside, I can’t wait to finally watch the movie adaptation of my favorite book. From the reviews I’ve been reading on the Internet, I am going to be happy once more. Cheers! All movie photo credits go to Relativity Media.